Caterpillar & Friends Discovery Walker is rated 3.7 out of 5 by 14. 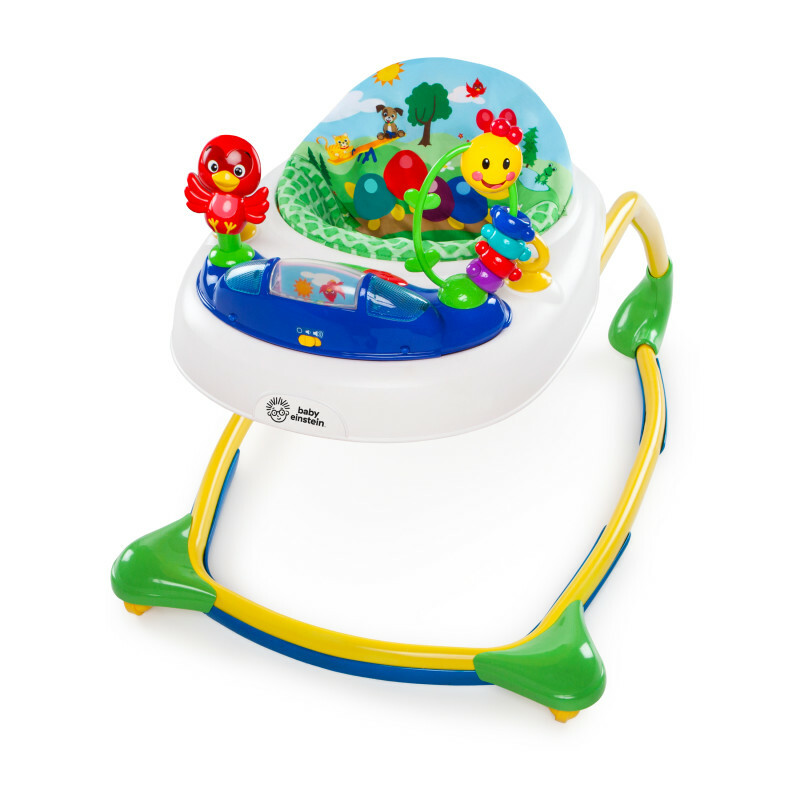 Brighten your baby’s day with the Baby Einstein Caterpillar and Friends Discovery Walker. Before your baby takes their first steps, the walker’s provides a sturdy platform to explore the world on two feet. Your baby will love the freedom to follow their sense of adventure, and their favorite toys are along for the ride. Discover classical melodies, play with the bead chaser and squeaker toys, and activate lights and sounds with numbered piano keys. As your baby grows, the activity center can be removed for fun floor play. Dimension (in) 34.5" x 31" x 19.5"
Rated 1 out of 5 by Yani from BAD BAD BAD BAD I bought this item, i read the reviews before i bought it and they said that the holes for the baby legs were very small, i bought it anyway because it was for my 5 month old baby he has very strong legs and can stand by himself since he was 3 months. I decided to buy a small walker so he can start moving his legs, really it ridiculous how the hold for the legs are .. he did fit in them but they were tight and my baby is only 16 lb, another very bad thing is the space between each leg, is very wide!!! My son was nt even able to stand up straight. I even call babyeinstein to see if they can send another seat , but the lady made it clear it will be the exact seat, and this is not because my son is verily 5 months old, he has the little superstar step n play piano and he move around perfectly. now i hv to put everything back in the box and take it back to the store. Rated 5 out of 5 by Daniel from Very versatile and secure! This walker is very flexible and sturdy. The rings to attach different toys are great! Rated 5 out of 5 by mahal209 from my baby loves it! My son was staring at it the whole time my husband was putting it together. A's soon as he was out in it he started going crazy with the toys lol he's 4 months and can touch the ground on the lowest hight setting. Very happy with our purchase. Rated 1 out of 5 by Joeal24 from The front two wheels broke within the first day I bought it a today and the front wheels on the Walker broke horrible!! Rated 4 out of 5 by Rheabee from Keeps baby entertained! We got this a few weeks back and it really keeps our daughter entertained letting us do chores which is so needed right now! It is a bit on the taller side so if your baby is on the lower end of the growth range thy might have a harder time fitting properly. It's nice that it functions with or without batteries. Rated 5 out of 5 by Jennifer M from So bright & colorful! This product was so easy to put together and is so bright and colorful! We put it together a little early for our little one, but the two year old was so excited by the box that she insisted it get together the day it came and then she promptly climbed into it despite us telling her it was too "small" for her. Surprisingly she fit in it anyway and has enjoyed explaining to her little sister whatever everything is. The little one loves looking at the colors and lights. Would highly recommend to anyone looking for a walker!